Can Oklahoma's Kyler Murray win a Heisman Trophy and become an MLB All-Star? Should Alabama's Tua Tagovailoa play this week against The Citadel? And what about Week 12's must-watch games? Adam Kramer explores what's happening in college football in his weekly notebook, the Thursday Tailgate. Kyler Murray shouldn't be doing this. He shouldn't be tormenting Big 12 defenses on a weekly basis or barging into the Heisman Trophy conversation. He shouldn't be trying to somehow crash the College Football Playoff. And he certainly shouldn't be making the task of replacing Baker Mayfield, the No. 1 overall pick in the 2018 NFL draft, look as easy as he has. But two-plus months into the season, Oklahoma's junior starting quarterback has done just that. Murray, not Alabama's Tua Tagovailoa, is the highest-rated QB in the nation. In 10 games, Murray has accounted for 39 touchdowns, thrown only five interceptions, passed for 3,038 yards and run for 640 more. As brilliant as Tagovailoa has been, Murray is ahead of him in just about every statistical category. And Tagovailoa is not alone. Murray is also on pace to shatter the single-season passing efficiency record, a mark Mayfield set last season. Still, some question whether he has any business doing this to begin with. This past spring, Murray, an outfielder on Oklahoma's baseball team, was selected by the Oakland Athletics with the No. 9 overall pick in 2018 MLB draft. While that ended his college baseball career, NCAA rules allows an athlete to keep eligibility in other sports. The top-10 draft status netted him a signing bonus of $4.66 million, according to MLB.com's Jim Callis. "He will be one of the best athletes in our game when he enters," the vice president of player personnel for one MLB team told B/R. "He will make some highlight plays with his glove in the outfield. He also has top-of-the-line bat speed and exit velocity for potential home run and extra-base production. "He looks like a Heisman candidate and a future MLB All-Star candidate." When Murray was selected in the MLB draft, the assumption was he would never play another down of football. Before he arrived at Oklahoma, Murray finished 43-0 as the starting quarterback for Allen High School in Allen, Texas. But last season, he was featured predominantly in mop-up duty behind Mayfield. His decision to continue playing football was met with surprise. Not just by those who wondered whether he should risk it, but also by some in baseball who were anxious to see if the A's selection was a smart one. "I don't think it is a wise choice for his baseball career," says an MLB scout of Murray's decision to focus this season on a different sport. "He needs ABs. I think it will hamper development." While that could prove true, it does not seem to concern Murray. Few football players offer the kind of excitement he does on every rep. A mix of improvisation and rare athleticism, Murray has passed for at least 300 yards all but three games this year. When asked, NFL scouts could offer little on the quarterback. Simply put, they see no reason to exhaust resources on a player they believe they won't have to evaluate for their sport. Before the season, Murray's agent, Scott Boras, told The Athletic that Murray would play quarterback at Oklahoma only for the 2018 season and that his baseball career had a "very defined path." Murray has been mum on his future. Whether that includes another year at Oklahoma or perhaps an unexpected detour to the NFL—a path far different than the one his agent laid out—will likely be determined in the months ahead. That is, long after the Big 12 Conference is decided and the Heisman is awarded following race that suddenly feels more competitive than it has in months. At a time when some of the sport's stars are doing whatever possible to limit exposure to injury, Murray, whose baseball signing bonus rivals the yearly salary of Lincoln Riley, who will make $4.8 million to coach Oklahoma this season, is playing out of love for his school and position. That might not be the case for much longer. So until it changes, enjoy him while you can. So…Who Should Be the Next Coach at Louisville? On Sunday, Louisville kicked off its coaching search in earnest by firing Bobby Petrino, less than two years after he guided former Cardinals quarterback Lamar Jackson to the Heisman. Given the 2-8 record and the fact that the Cardinals had given up 291 points in their past five games, a change felt inevitable. Louisville will be on the hook to pay Petrino a buyout that is "estimated in the $14 million range," according to Pat Forde of Yahoo Sports. So who should replace him? That's easy. It should be Purdue's Jeff Brohm. This is not a bad idea, even if it's an obvious one. In fact, it's a fine idea. Even though Brohm's team just lost 41-10 at Minnesota in one of the more bizarre results of the year, luring the Purdue head coach back to his hometown would be a brilliant move. He was there. He played quarterback there. And before he became one of the sport's most coveted coaches, he worked there. Other head coaches who'd be worth pursuing: Dino Babers (Syracuse), Luke Fickell (Cincinnati), Mike Norvell (Memphis), Neal Brown (Troy) and Clemson defensive coordinator Brent Venables. 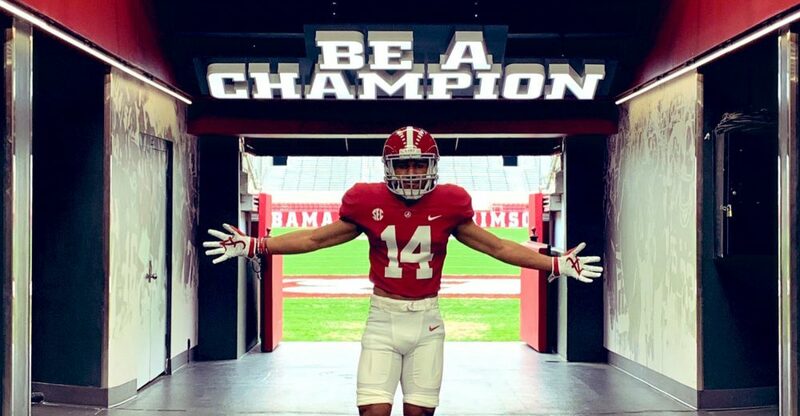 Should Tua Tagovailoa Play This Week? No. That should be the end of it. Tagovailoa should be kept in bubble wrap until the Iron Bowl on Nov. 24. Against Mississippi State, after being pressured throughout much of the first half, Tagovailoa was hit low and knocked out of the game in the third quarter. The right knee injury that's plagued him throughout much of the year seemed to be the cause of his departure. And while Alabama head coach Nick Saban has played down the injury's severity, he also made it seem like Tagovailoa will play this week against The Citadel, the Crimson Tide's grossly overmatched Week 12 opponent. You could play quarterback for Alabama this week. Yes, you. And Saban's team would be fine. As Jalen Hurts recovers from minor ankle surgery, third-string quarterback Mac Jones, who has completed five throws this year, should take every rep.
Could this negatively impact Tagovailoa's Heisman candidacy? Perhaps. But even if he played, would two or three touchdowns in less than a half make any difference? There will plenty of other opportunities for Tagovailoa to seal the deal in the weeks ahead. Historically, the weekend before Thanksgiving is light on intriguing matchups. That is a polite way of saying the overall slate of football games is typically bad, and this year is no exception. Still, it is football, and we are running out of weekends. Cherish every one. Plus, while the overall slate might be lacking, a game with major College Football Playoff implications will take place. Here's what you should watch in Week 12, summarized in tweet-length form. (All game times Eastern, and all rankings courtesy of the College Football Playoff selection committee). No. 12 Syracuse vs. No. 3 Notre Dame (Saturday, 2:30 p.m.): They will play in Yankee Stadium, an odd backdrop for the second-to-last leg in Notre Dame's playoff push. Washington State, Oklahoma and West Virginia fans will have a close eye on this. Win and Notre Dame is (almost) in. No. 16 Iowa State at No. 15 Texas (Saturday, 8 p.m): Texas quarterback Sam Ehlinger is putting up the best season that not many are talking about, accounting for 29 touchdowns while throwing only two interceptions. The Longhorns, meanwhile, look reborn, although a few more wins would go a long way toward confirming that. No. 24 Cincinnati at No. 11 UCF (Saturday, 8 p.m.): The best game that far too many won't watch will feature teams with a combined record of 18-1. Maybe a lighter schedule will give these two the appropriate spotlight they deserve. Also, did you know the last time UCF lost was December 17, 2016? Yeah. That was a long, long time ago. No. 9 West Virginia at Oklahoma State (Saturday, 3:30 p.m.): It's probably going to get weird. There will probably be 75 to 100 points scored. And in Stillwater, the Pokes are a threat to derail West Virginia's push to the playoff. Oh, and the respective head coaches' unique, amazing hairstyles will be on full display. This will be fun. UAB at Texas A&M (Saturday, 7 p.m.): There are cases to be made for other games in this fifth spot, but at 9-1 and two years removed from not having a football program, UAB warrants as many eyeballs as possible. The Blazers head to the SEC for their toughest game of the year. An upset seems unlikely but still feasible. UCLA has looked better in recent weeks, but its record is difficult to ignore. USC, fresh off its third loss in four games, looks like it's slipping further and further away from what it once was. That is not exactly a ringing endorsement for a game that should feel much bigger than it does, but there you have it. The good news? These are some of the best-looking uniforms in football, and the contest will look great on television regardless of the quality of play. Somewhat quietly, after a disastrous start, Arizona is 5-5. Coming off his best game of the year and a bye, quarterback Khalil Tate might be finding his way in coach Kevin Sumlin's offense. Cougars coach Mike Leach, meanwhile, celebrated a victory at Colorado by throwing on a fake mustache in his postgame interview. He had a little help from his starting quarterback, Gardner Minshew II, whose mustache is very real and spectacular. Given the likelihood of a large number of points and the fact that Wazzu's playoff possibilities are still on the line, this late-night clash (Saturday, 10:30 p.m.) is worth staying up for. I would like to thank LSU running back Nick Brossette for avoiding scoring a touchdown late in the game against Arkansas. It helped me salvage a losing week that could've been worse. As for this week, it's time to get right. Here are this week's (winning) picks, using lines provided by OddsShark. Wake Forest (+7) vs. Pittsburgh: Thank you, Pitt, for the cover last week. However, this is where we go our separate ways. Missouri (-6) at Tennessee: I pulled Tennessee out of the picks at the last second last weekend, and I regret it. This week, we're picking against the Vols, given the strong possibility of a letdown. Oklahoma State (+4.5) vs. West Virginia: This could well be Bedlam 2.0. Final score: Oklahoma State 48, West Virginia 45. UCLA (+3.5) vs. USC: Another strong upset possibility here. Take Chip Kelly and the points. Fresno State (-13) vs. San Diego State: Despite Fresno's loss to Boise State last week, I am a huge believer in the Bulldogs. They'll win big at home. Minnesota (+2.5) vs. Northwestern: Yes, I picked Iowa last week. Yes, Northwestern covered and won outright. Yes, I am going back to the well. B/R's Scott Miller contributed to this report.